Opening on the top of the initial support zone at 29.75, there was a brief rally towards the overnight high which failed and retest of support. Buyers then pushed up to the initial resistance zone which didn't tale long to pop through, accelerated with buy stops and moving to yet another all time high at 2538.00. The prior resistance became support on a pullback and value built above the prior day's, albeit on very low volume again (943k). 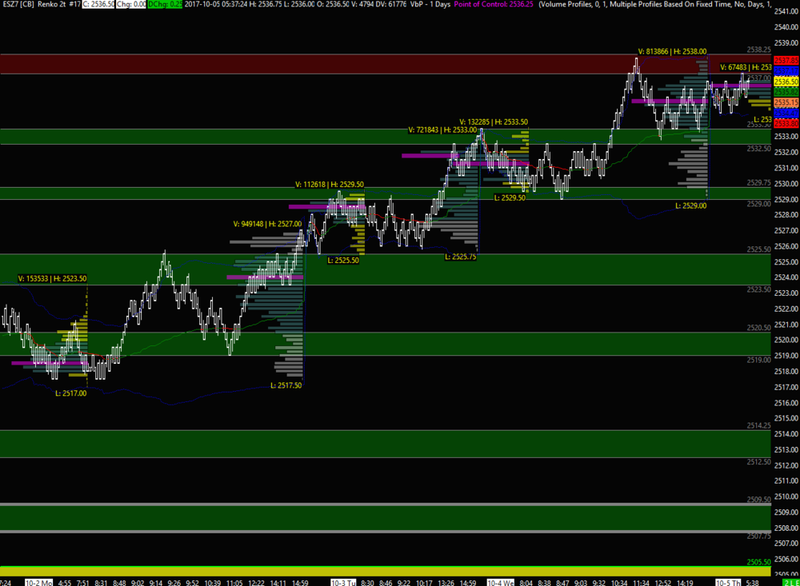 Settlement was at 2536.25 and a prominent POC/VPOC left at 35.25. The market has not taken out the previous day's low since Sept 24th - 8 trading sessions! That doesn't mean that will change today, but when it does we could get what Jim Dalton refers to as the firecracker effect when stops get triggered at prior lows and momentum keeps the move accelerating through more stops. I said in a previous note that I'd like to see the 2509.25 area retested, which was a breakout point leaving single prints. 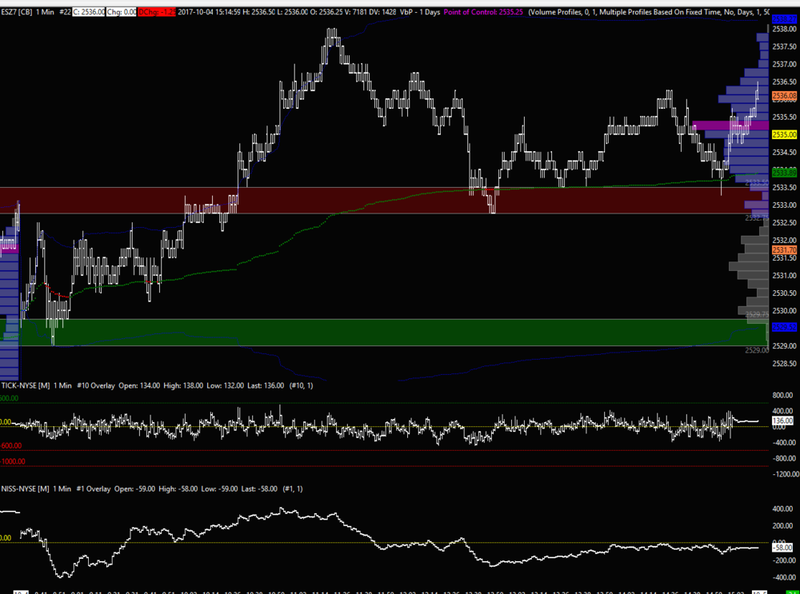 The launching point of this move was the 2504.75 composite high volume node (CHVN). For these reasons I have 2507.75-09.50 as a multi time frame support zone and 2504.25-05.50 as the short term bull/bear zone. Tomorrow's employment report has potential to be a catalyst for some well needed volatility and daily range expansion. Overnight so far the range is just 2534.50-37.00, above yesterday's mid and within prior value. 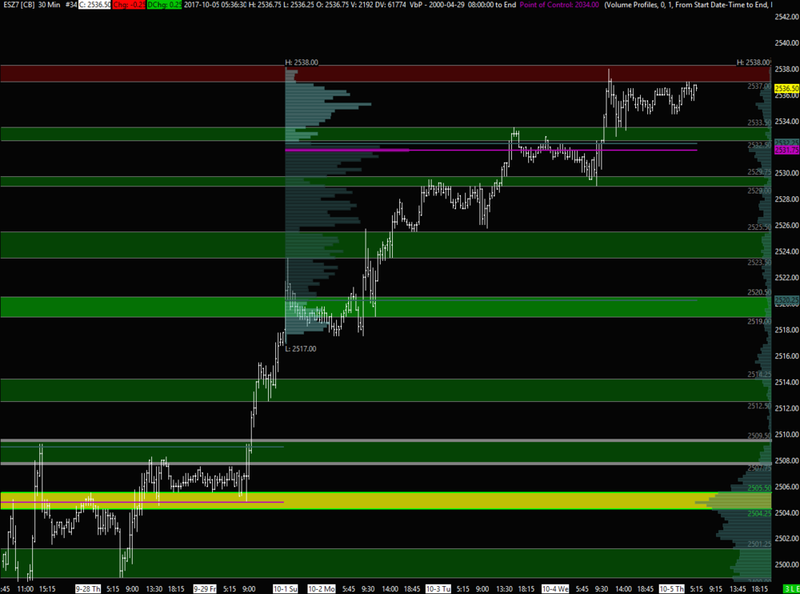 Zones of interest for today below. All time frames remain bullish for now and as always real time context and assessment of market state is needed when the market enters any zones. Trying to pick tops can be an expensive fruitless task and buying up here may not give a desirable reward to risk, so no harm in sitting on the sidelines until better opportunities arise at more favourable trade locations.